1) Tell us the history of your winery. Our winemaker, Noah Wright, went through an intensive program in Napa Valley at the Rudd Wine Institute at the Culinary Institute of America, and the Oz Winery opened in Wamego in 2007. We make every bottle of Oz wine on site and have a free tasting bar daily. While we take our wine seriously, we strive to offer a relaxed, inviting atmosphere. We like to take away the intimidation factor and just encourage people to drink the wines they like. 2) Do you own a vineyard? Currently, we are strictly a winery. We buy from a number of growers within the state and a few outside of Kansas. While we do use varietals that people regularly associate with wine (Merlot, Chardonnay, etc. ), we also make lesser known wines that grow well in our part of the country. 3) How does the location of a vineyard affect the grapes – and the wine? The varietals that grow in this part of the country have a completely different set of flavor and aroma characteristics than those that grow in California. We do our best to maintain the integrity of the Kansas grape by enhancing the components that make it unique in order to produce a flavorful, stable wine. 4) What is the one “must try” wine? We offer a wide variety of reds and whites that range from dry to sweet, a couple of dessert-style wines and a couple of blushes. Our top-selling wine is called Squished Witch, a semi-sweet red wine we have a hard time keeping stocked! 5) Where can we find your products? 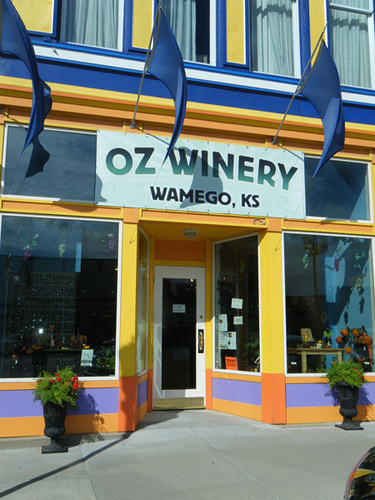 At this time, Oz wine can be purchased only through our Wamego store, but we can ship wine directly to customers in most of the United States. 6) What events or special occasions do you offer at your winery? Guests at our Private Wine Tasting Parties can sample all of the wines we have available paired with cheese and crackers or hors d’oeuvres (I’m a Certified Pastry Chef). We also have an extensive gift shop with wine accessories, cigars, stemware, clothing, gift baskets and gift certificates. Learn more about the Oz Winery.